Oh My Stars wallhanging (16 1/2″ x 23″) is finished – binding, sleeve and all. The best news is that I found my decorative hanger that I use to display my small wallhanging. Now I just need to decide where to place the hanger to showcase my small quilts. 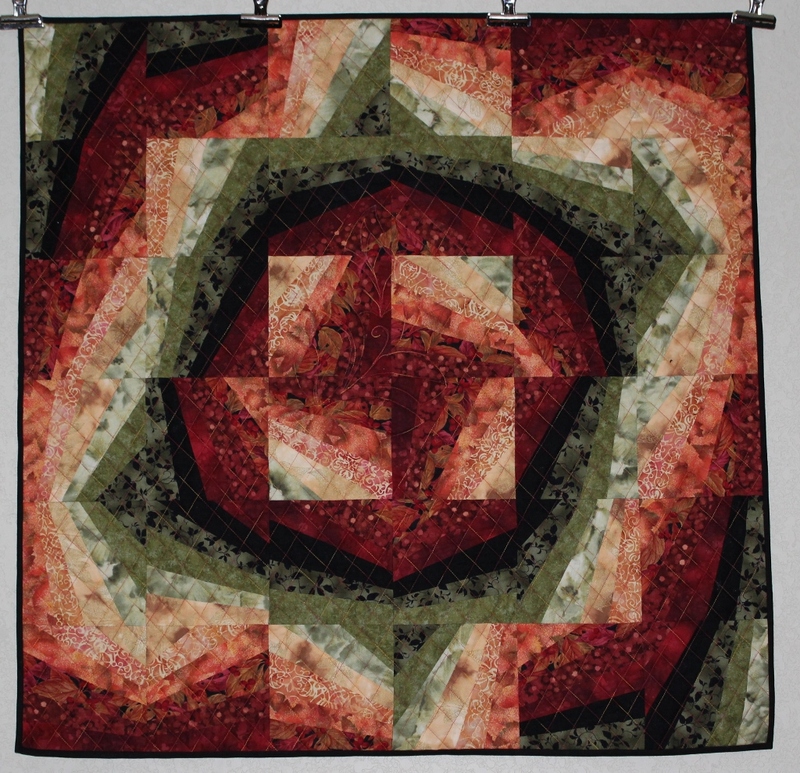 The focus this last week has been on the Tumbler quilt – and it is finished. The quilting was completed on Wednesday, Thursday I trimmed and sewed on the binding, and by noon on Sunday the hand stitching was done. This is the largest quilt that I have machine quilted myself and I am so happy to have a new winter bed quilt. The picture is taken from the upstairs looking down into the living room. It was the only place to lay it out for a photo shoot. And since I had so much fun with the backing, here is a picture of it. I am very pleased with the end result. During the breaks from the hand-stitching, I pulled out this small wallhanging (17″ x 23 1/2″) and stitched in the ditch. 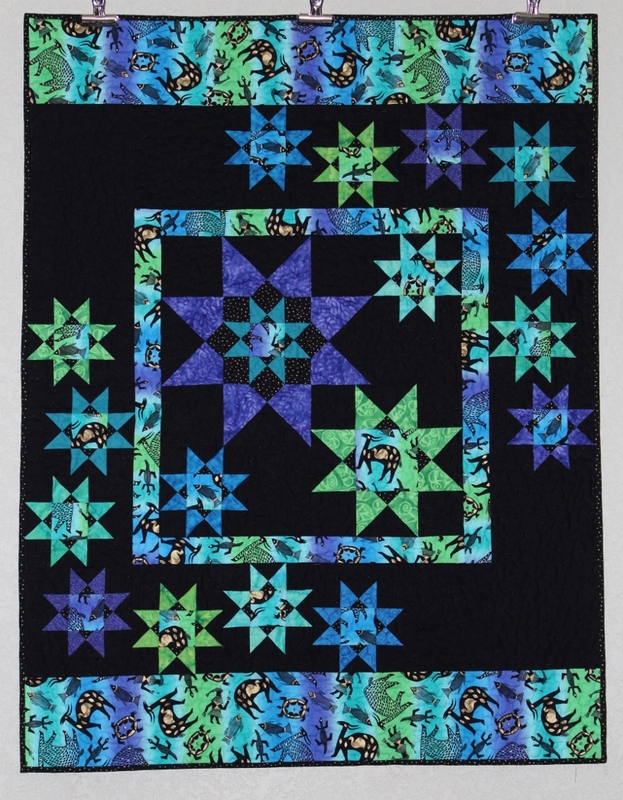 This little quilt was pieced in 2013 and the name of the pattern is Oh My Stars. Once the sleeve and binding are completed, this will be my 21st finish for the year. Oh yeah – this is a design wall post! I decided to take a break from the star quilts and finish the leader/ender quilt top. 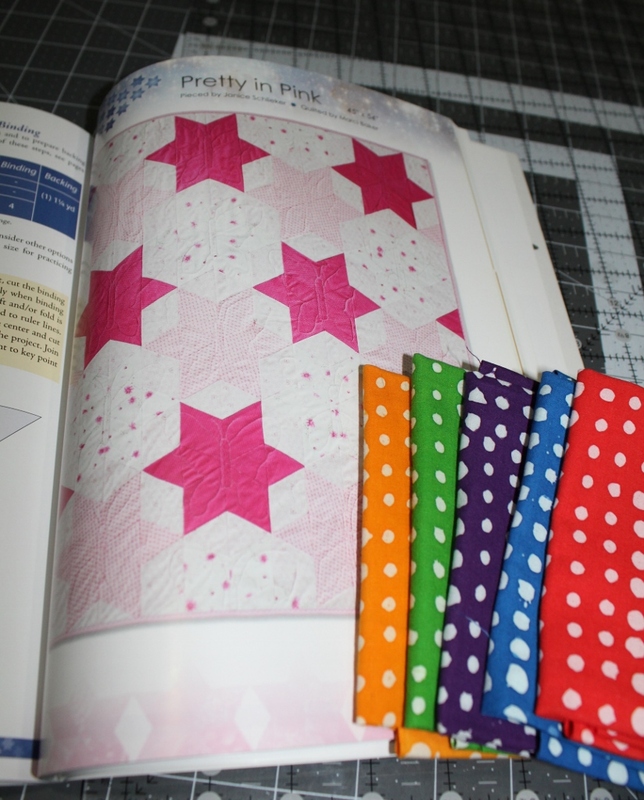 The pattern is Thirty Something from the June 2015 issue of American Patchwork & Quilting although my quilt’s name will be Scrappy Something since I didn’t use 30’s fabric. The reason that this project was temporarily pushed aside was because I need to do a count to see exactly where I was. This is the top row and part of the second row. 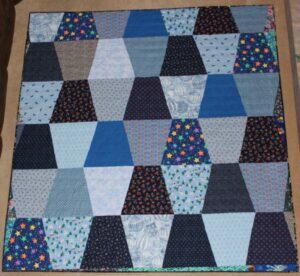 I have been busy cutting out the triangles need for the blocks in the second row, so then it should go together quickly. 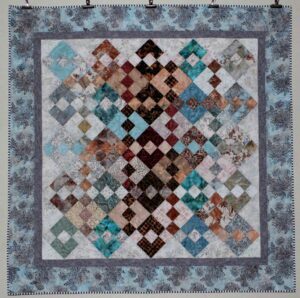 Check out Judy’s Design Wall Monday for more quilting inspiration. The basket wallhanging is finished and measures 38″ x 38″. 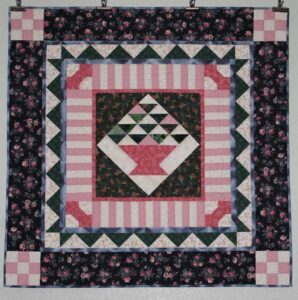 I stitched in the ditch in the center and the pieced borders, then quilted a flower motif in the setting triangles and outer borders. 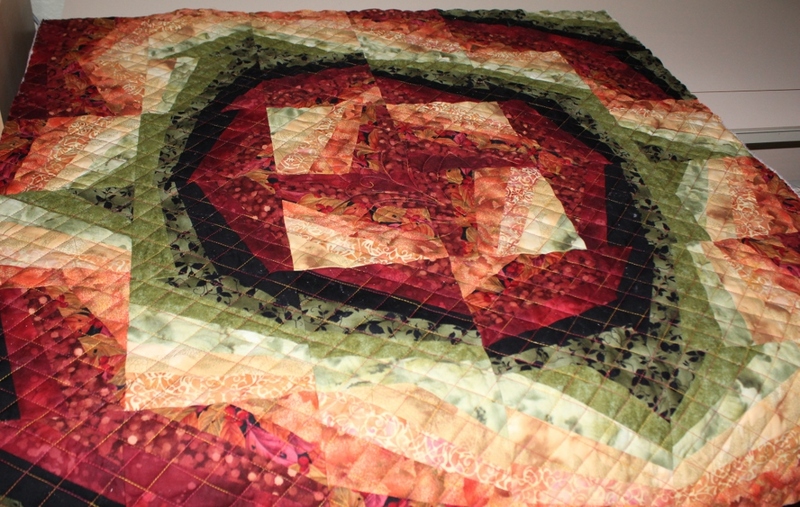 It is a wonderful feeling to view a finished quilt! If we love nature as we love ourselves, the earth will become beautiful and all good things in our human lives will come to be part of the earth. Since the charms are blue & white it was an easy decision to add black for the star points. The Star Fusion directions also call for cutting the outer star points from a string set. 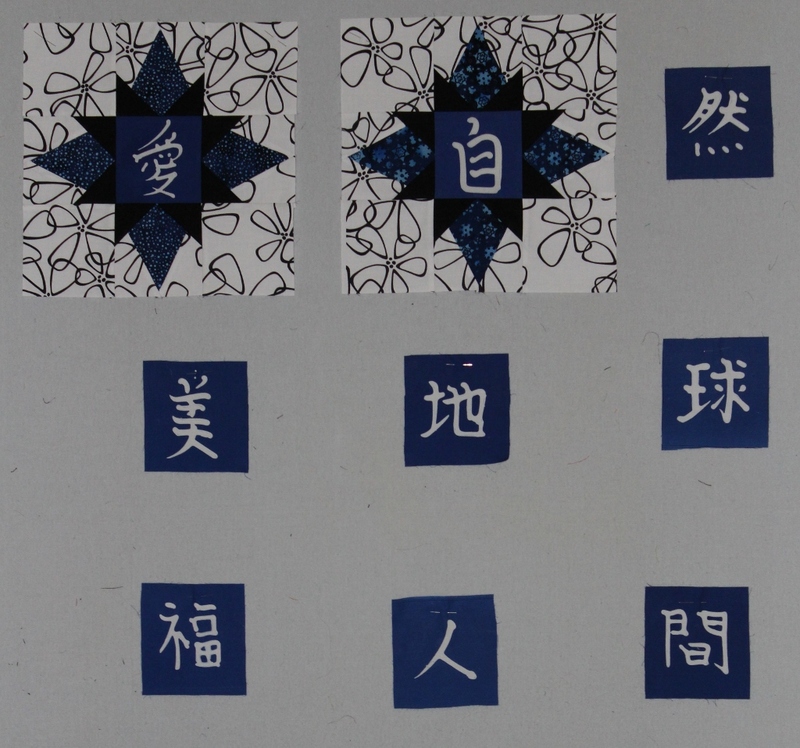 I want the focus to be on the oriental characters, so I went with a single fabric outer star point. 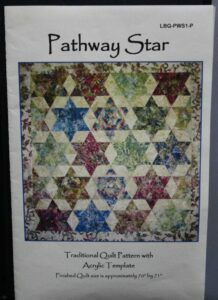 In fact the outer star points in these two blocks is leftover fabric from the Pathway Star quilt top. At first I was concerned that the background fabric was too busy, but now I like it. I don’t recall that I have made a black/white & blue quilt top before, so this will be a first. The Serengheti wall hanging is finished – the 18th for the year. 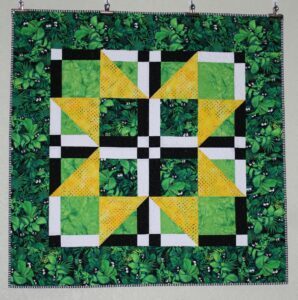 Since the center block measures 17″, it would be fun to make 9 or 12 of them for a larger quilt. Just an idea pinging around in my head, but not for right now – I need to stay focused on my list of star patterns instead. Speaking of star patterns, this will be the next star project. The finished quilt size is listed as 70″ x 71″, but I would like it a bit longer for a twin sized quilt. It may be a bit hard to see in the photo, but the top & bottom rows of stars have the points missing which I find a very strange design decision. 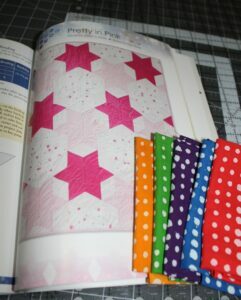 It will be really easy to add one more row to include the star tips and it will add about another 10″. 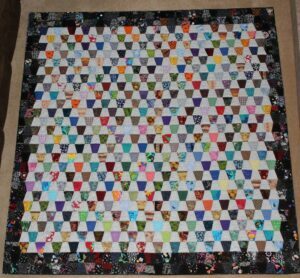 This quilt is going to be easy – cut out all the triangles for the stars & background, sew the triangles together in rows and then sew the rows together along with the border. 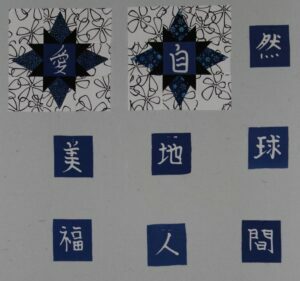 I am using blue & gray snowflake fat quarters for the stars with a white batik with very pale blue snowflakes as the background and a light gray for the border. The triangles for each star are cut from 5 1/4″ strips, so each star is huge – before seams each star measures 21″ from point to point. Looking at the photo I already know that I will be moving some of the stars around. I have also started a new leader/ender project – tumblers. 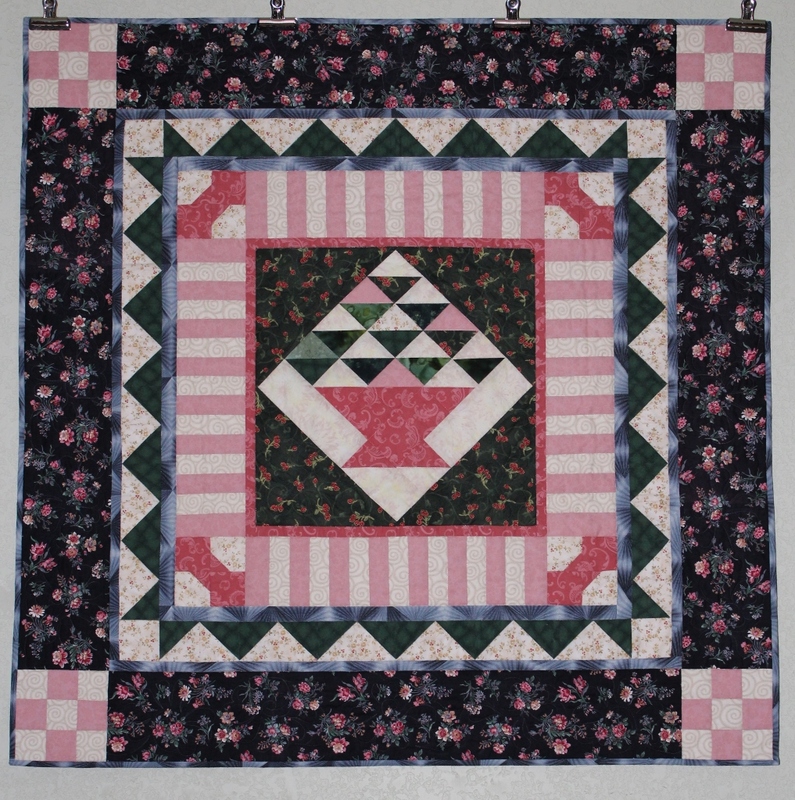 The quilt that was the leader/ender project is the cover quilt Thirty Something from the June 2015 issue of American Patchwork & Quilting magazine. 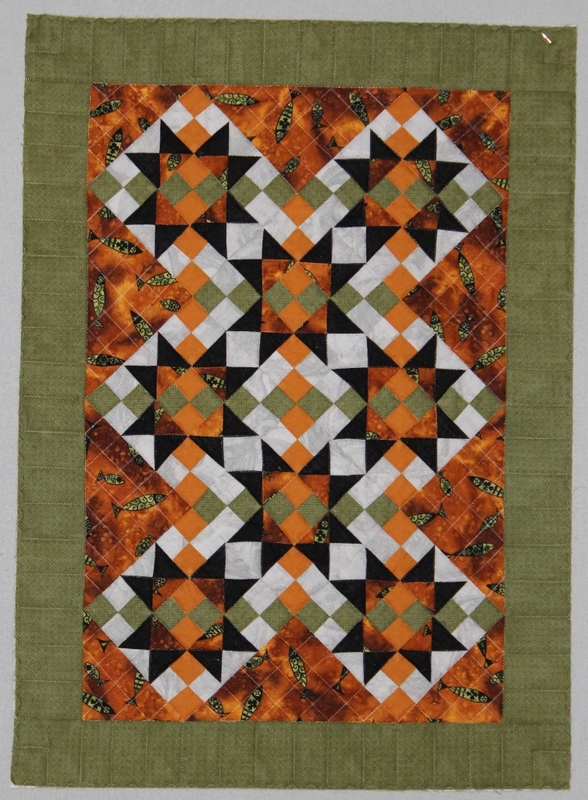 I have been sewing 4 patches from 1 1/2″ squares which have become rather boring. Also I need to do a count to see where I am with them so that is two good reasons to set it aside for the moment. 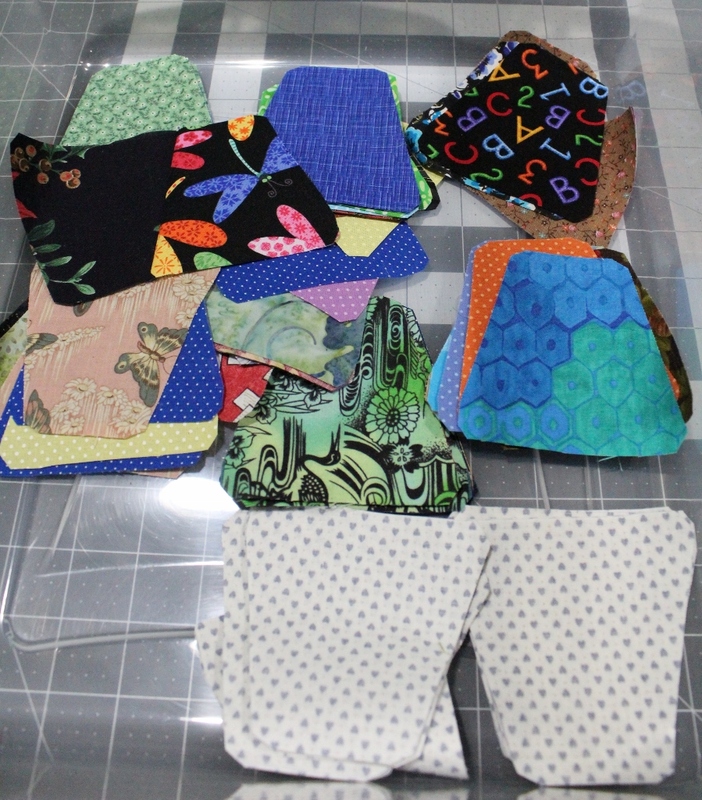 The tumbler die for my Accuquilt Studio had never been used and 3 1/2″ tumblers are fun quick sewing – tumblers it is. In a little under an hour I had all these cut out. Actually there were more than this because the first row is already completed. I wanted to know how many tumblers to put in each row & how many rows to make a twin sized quilt. The answer is 35 tumblers and 35 rows. The white with small blue stars will be consistent throughout the quilt. I found a 3 1/2 yard piece in my stash which I think will be enough. If it is not then I will come up with a plan B. 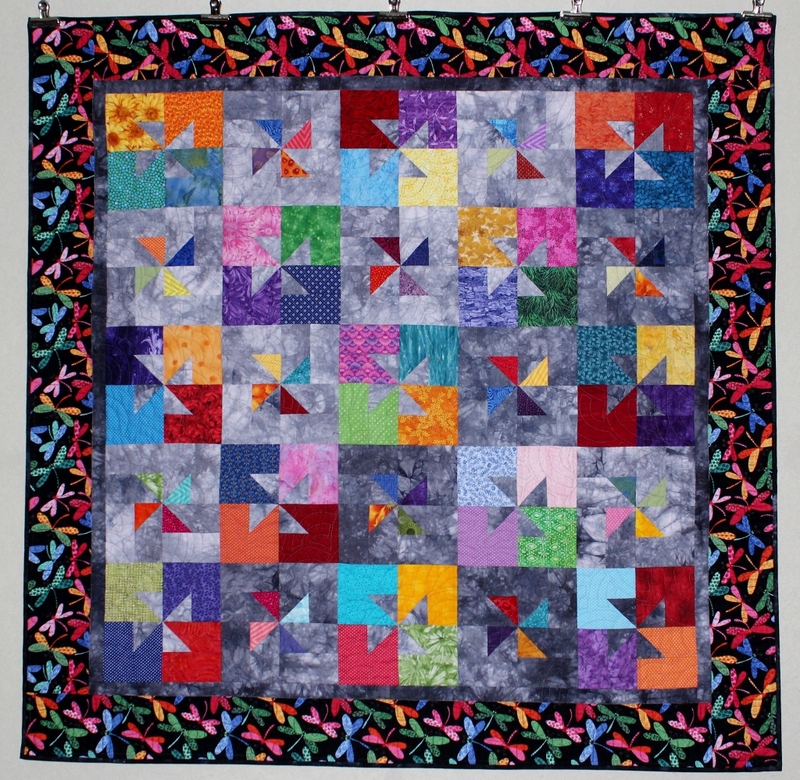 Check out all the other quilting news at Judy’s Design Wall Monday. Carolina Chain is now a finished quilt. 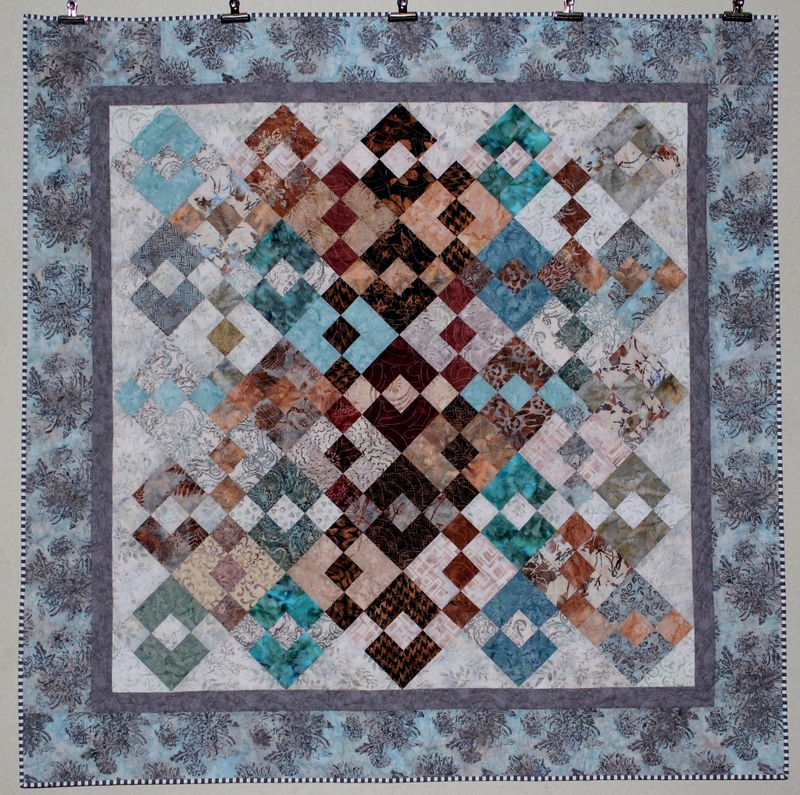 There are so many things that I like about this quilt – the layout where the darker blocks in the center shade out to light at the edges, the gray & white strip binding, the texture added by the Baptist Fans quilting motif and the way the blue & cream variegated thread blends so well with the blocks. To celebrate the completion of Carolina Chain I fused the applique pieces on two more Happy Halloween blocks. I need to keep working on this project so that it doesn’t end up as a UFO. Here is a picture of the four blocks with the two new ones on the bottom. 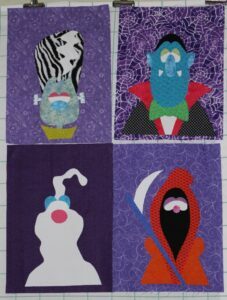 Dracula is the only block with all the machine applique added. My plan is to do the machine applique once all 12 blocks are ready. I doubt that it will be completed this year, but it should be hanging for Halloween 2016. 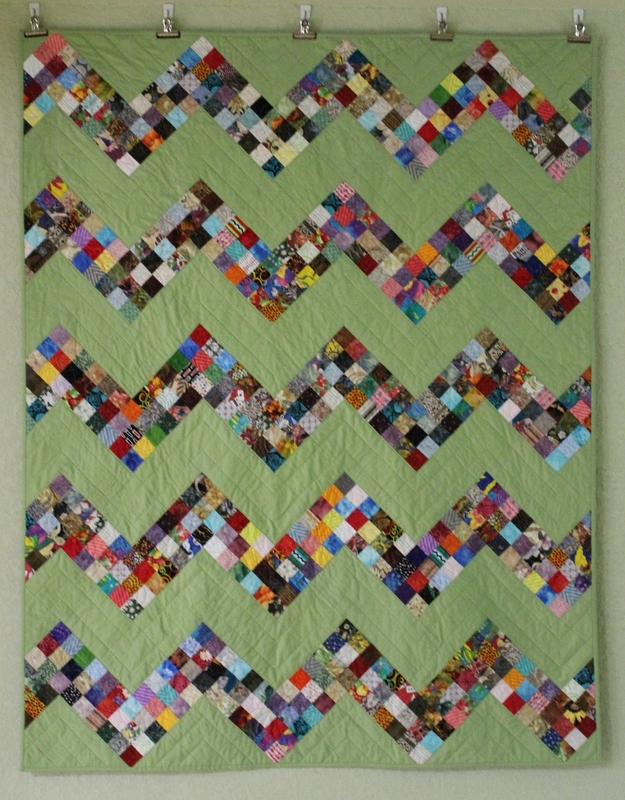 This quilt from the book Easy Pieces by Margaret Miller is now completed – binding, sleeve and all. The machine quilting shrunk it up an inch, so now it measures 35 1/2″ square. 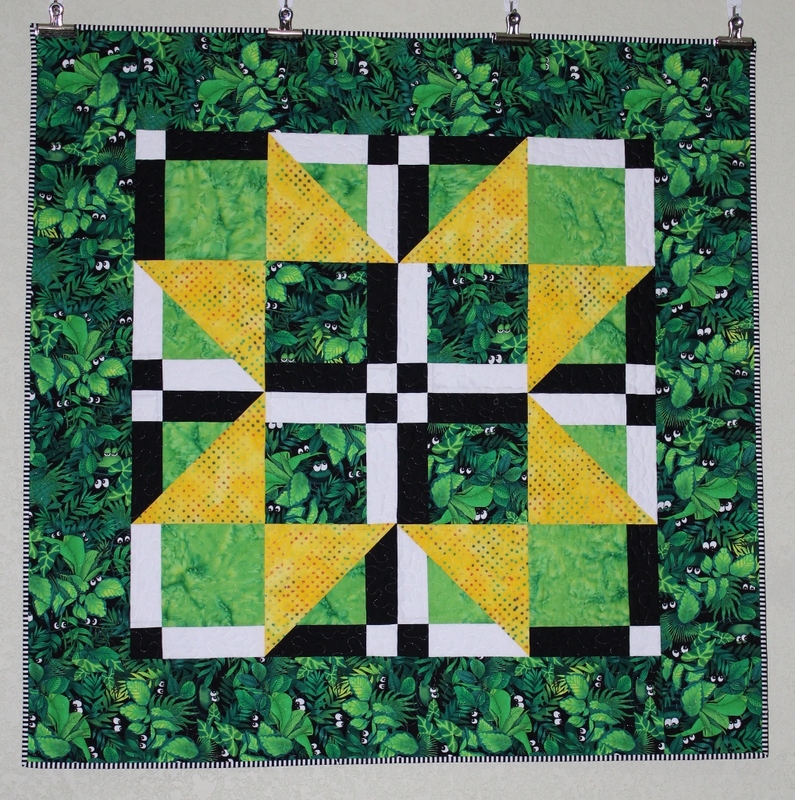 This brings the count of finished quilts for 2015 up to 15. I just need one more and I will have reached my goal of 16. The Spiderweb quilt (48″ x 56″) is finished. I machine quilted a giant spider web motif in variegated pastel thread. 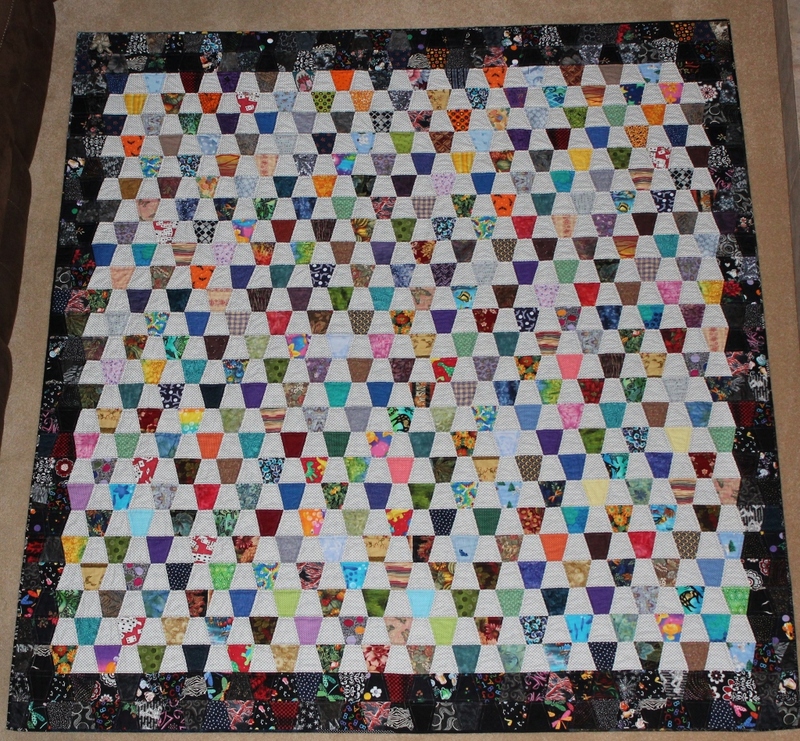 Here is the best picture that I could get of the quilting. The machine quilting on the next quilt top has been completed and now I am hand-stitching the binding down. I used a leaf stencil in the middle and then cross-hatched the rest with a red-orange-yellow variegated thread. Once the black binding is on I will be able to see if I made the correct choice. While working on all these finishes I have made a decision about my next piecing projects. I have decided to go with a theme – Stars – and have pulled out 8 or 9 star patterns. They range in size from small baby to twin, so I am hopeful to get 5 or 6 done this year. The first one will be Pretty in Pink using these bright batiks. 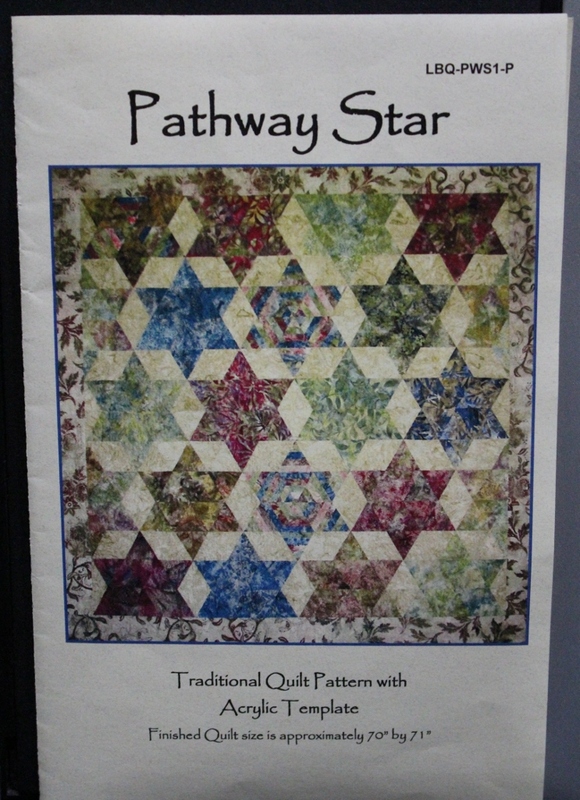 I am sure that a couple of other projects will sneak, but it will be fun to work on the different star quilts. 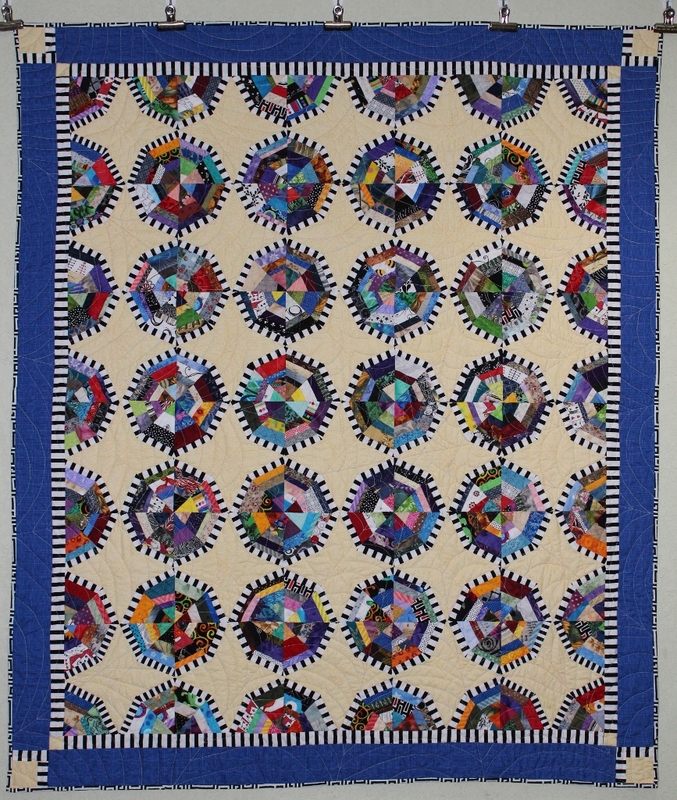 My fingers are sore, but the binding is completed on the Pinwheels on Parade (49 1/4″ square) quilt. I suspect that it was the hand dyed fabric for the binding that was so hard to hand stitch. Whatever the reason, this is now a finished quilt. I quilted a free form Baptist Fan with a dark gray thread in the center and a ribbon design with black thread in the border. Now I am machine quilting my Spiderweb top with a large spiderweb design. The plan is to be stitching the binding down on Friday. It is very satisfying to finish up these tops. My sewing area is a disaster of indecision. 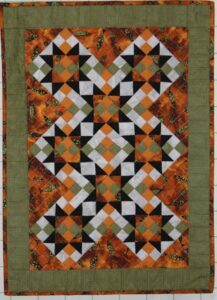 I am ready for a new project that is a more of a challenge – either a new technique or more complicated piecing. 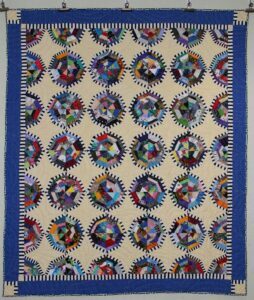 My current list is 1) Amish Wedding Ring in the Encyclopedia of Classic Quilt Patterns book, 2) Gypsy Wife by Jen Kingwell and 3) Flags Flying by Sara Nephew in the book Not Your Grandmother’s Log Cabin. All three quilts are on the smaller size, so maybe I need to make all of them. While trying to make a decision I have been machine quilting tops. The middle of last week I picked out 8 – 10 quilt tops to be finished. I don’t know if I will get them all completed, but I will continue working on them until I get distracted. This is my first finish – Disappearing Frogs. I always have a hard time deciding on thread color with a high contrast quilt, so I used my old standby – monofilament thread in a stipple pattern. The quilt measures 38 1/2″ square and I think that the black & white striped binding was the perfect finishing touch. And what is on my design wall? Another quilt top to be finished of course! This top was made sometime between 2002 and 2008. 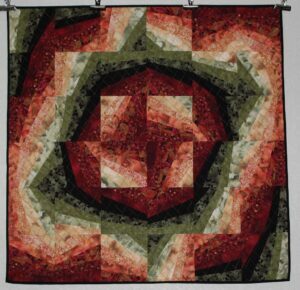 Towards the end of 2008 I started recording the finish date of my quilt tops and this one was made sometime before that. 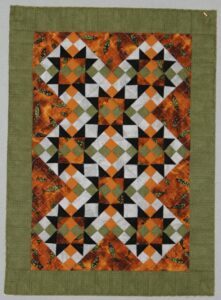 It is from Margaret Miller’s book Easy Pieces and measures 36 1/2″ square. The fabric on the right is the backing along with a quilting stencil that I plan to use and the batting is draped on the left side. I was tempted to use the backing as a border, but in the end I decided to go borderless. The Pinwheels on Parade quilt is at the hand stitching the binding down stage, so that one should be finished in a day or two. One of my goals for this year was to finish 16 quilt tops. The Disappearing Frog quilt brings my total to 13, so I am confident of over-achieving that goal. 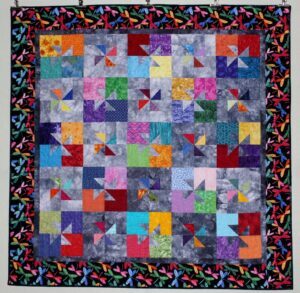 Check out all the other quilt inspiration of Judy’s Design Wall Monday. 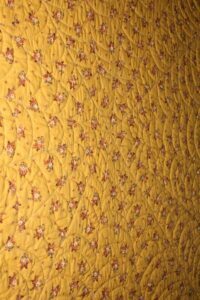 The Bloomin’ Peaks quilt is my 10th finish for the year. 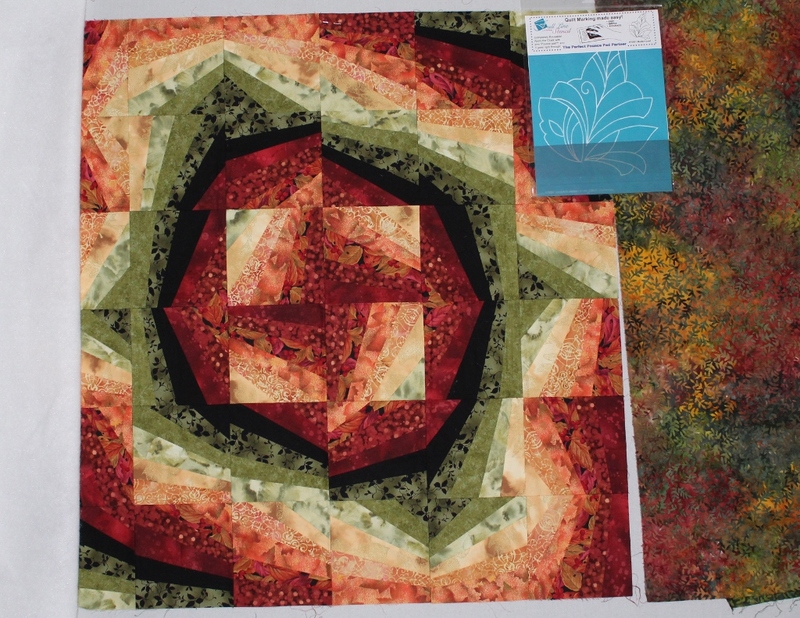 The top was completed in April and the quilt in May which is a pretty fast finish for me. 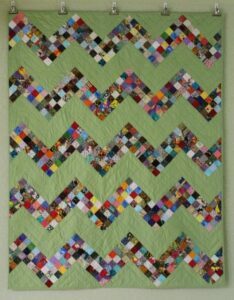 I stitched straight line zigzags in the green blocks with my walking foot and free motion quilted in the scrappy blocks. 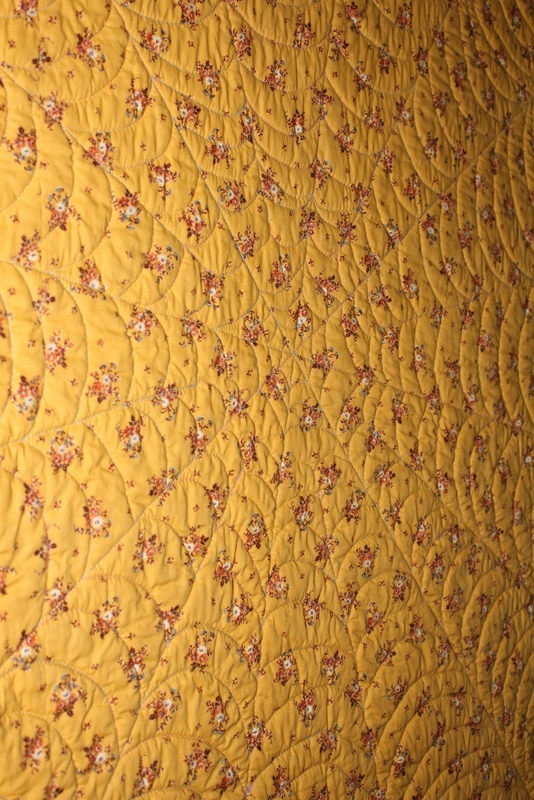 Bloomin’ Peaks measures 51″ x 64″ – a nice couch sized quilt. Since I couldn’t quite decide on my next project, I am working on three. 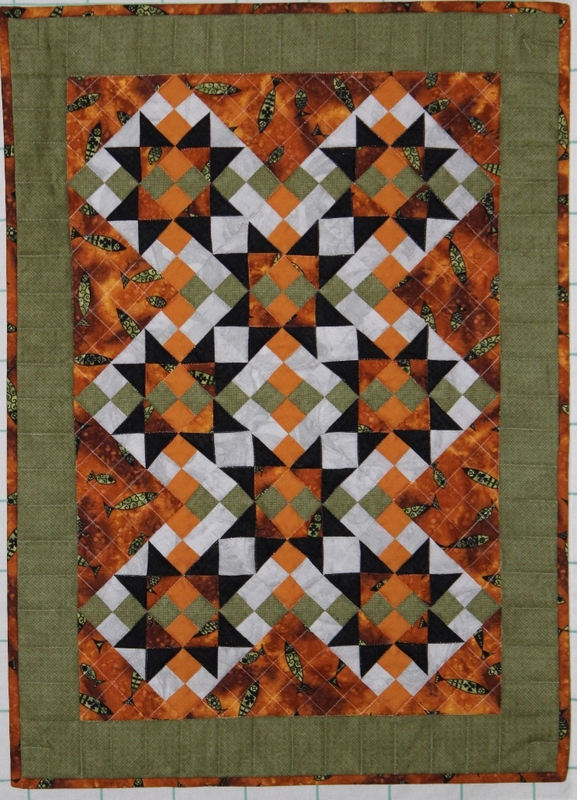 My leader and enders project is the cover quilt on the latest American Patchwork & Quilting magazine, Cascades by Black Cat Creation, and an appliqued Halloween quilt by Amy Bradley Designs. What was I thinking to tackle another applique quilt? This one is all machine applique and it is just so darn cut that I couldn’t resist. I am half way done with the first block (a vampire) and will photograph it when completed.